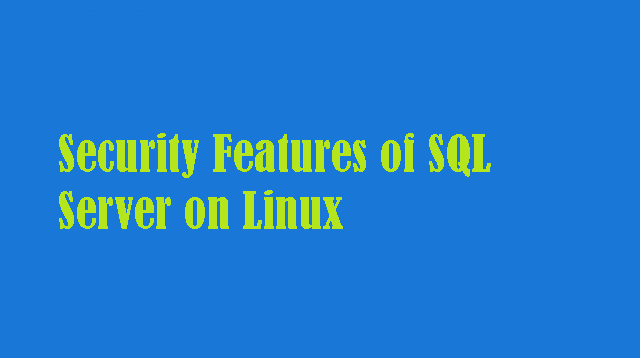 This guide will walk you through some of the security tasks if you are running SQL Server on Linux. These are not unique or specific to Linux, but it helps to give you an idea of areas to investigate further. The following examples use the AdventureWorks2014 sample database. For instructions on how to obtain and install this sample database, see Restore a SQL Server database from Windows to Linux. Always use a strong password in place of the asterisks above. Logins can connect to SQL Server and have access (with limited permissions) to the master database. To connect to a user-database, a login needs a corresponding identity at the database level, called a database user. Users are specific to each database and must be separately created in each database to grant them access. The following example moves you into the AdventureWorks2014 database, and then uses the CREATE USER statement to create a user named Larry that is associated with the login named Larry. Though the login and the user are related (mapped to each other), they are different objects. The login is a server-level principle. The user is a database-level principal. A SQL Server administrator account can connect to any database and can create more logins and users in any database. When someone creates a database they become the database owner, which can connect to that database. Database owners can create more users. Now the login Jerry can create more logins, and the user Jerry can create more users. The first people to connect to a user-database will be the administrator and database owner accounts. However these users have all the the permissions available on the database. This is more permission than most users should have. When you are just getting started, you can assign some general categories of permissions by using the built-in fixed database roles. For example, the db_datareader fixed database role can read all tables in the database, but make no changes. Grant membership in a fixed database role by using the ALTER ROLE statement. The following example add the user Jerry to the db_datareaderfixed database role. Later, when you are ready to configure more precise access to your data (highly recommended), create your own user-defined database roles using CREATE ROLE statement. Then assign specific granular permissions to you custom roles. For example, the following statements create a database role named Sales, grants the Salesgroup the ability to see, update, and delete rows from the Orders table, and then adds the user Jerry to the Sales role. Row-Level Security enables you to restrict access to rows in a database based on the user executing a query. This feature is useful for scenarios like ensuring that customers can only access their own data or that workers can only access data that is pertinent to their department. The steps below walk through setting up two Users with different row-level access to the Sales.SalesOrderHeader table. Create a new schema and inline table-valued function. The function returns 1 when a row in the SalesPersonID column matches the ID of a SalesPerson login or if the user executing the query is the Manager user. Execute the following to query the SalesOrderHeader table as each user. Verify that SalesPerson280 only sees the 95 rows from their own sales and that the Manager can see all the rows in the table. Alter the security policy to disable the policy. Now both users can access all rows. Dynamic Data Masking enables you to limit the exposure of sensitive data to users of an application by fully or partially masking certain columns. One threat to your database is the risk that someone will steal the database files off of your hard-drive. This could happen with an intrusion that gets elevated access to your system, through the actions of a problem employee, or by theft of the computer containing the files (such as a laptop). Transparent Data Encryption (TDE) encrypts the data files as they are stored on the hard drive. The master database of the SQL Server database engine has the encryption key, so that the database engine can manipulate the data. The database files cannot be read without access to the key. High-level administrators can manage, backup, and recreate the key, so the database can be moved, but only by selected people. When TDE is configured, the tempdb database is also automatically encrypted. Since the Database Engine can read the data, Transparent Data Encryption does not protect against unauthorized access by administrators of the computer who can directly read memory, or access SQL Server through an administrator account. Configuring TDE requires CONTROL permission on the master database and CONTROL permission on the user database. Typically an administrator configures TDE. The following example illustrates encrypting and decrypting the AdventureWorks2014 database using a certificate installed on the server named MyServerCert. SQL Server has the ability to encrypt the data while creating a backup. By specifying the encryption algorithm and the encryptor (a certificate or asymmetric key) when creating a backup, you can create an encrypted backup file. The following example creates a certificate, and then creates a backup protected by the certificate.